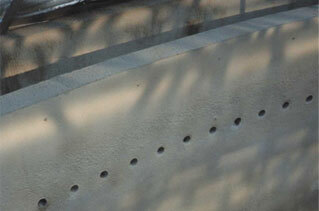 Potable Water Tank Lining : Astek Composites Inc.
For steel tanks refer the MarineCoat page. For concrete tanks, see below. 2. The system is impervious to UV degradation. 3. The acrylic mortar cover is extremely abrasion resistant. 4. Less surface preparation is required than for most other systems. 5. It may be applied to fresh concrete or damp concrete. In fact, the system must be applied to damp concrete. This results in faster turnaround times. 6. It is easily patched and maintained. 7. MarineCoat is a green product which is safe for both the applicators and end users. 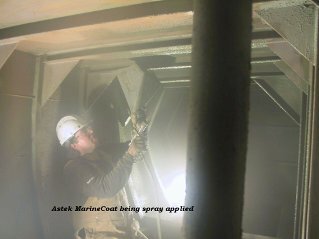 Astek MarineCoat being spray applied. Completed in 2000 and still going strong! Copyright 2011 Astek Composites Inc.